Art in the Woodlands School style comes from the Anishinaabeg of the Great Lakes region. 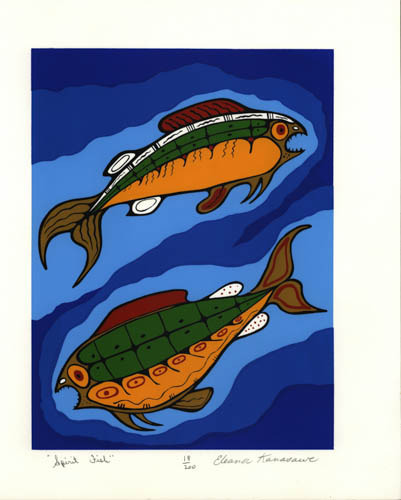 It includes work by Ojibwe, Odawa, Potawatomi, Oji-Cree and Cree artists. This artistic movement was at its height in the 1970s, a period when Indigenous people across North America began more actively expressing ideas of independence and self-determination. While the term Woodlands School is widely used, it is not a term that all artists feel comfortable with. As among other artists—native and non-native alike—categorical labels such as Woodlands School or Impressionist are sometimes felt as limiting, pigeonholing artists into a single fixed style.